USER SCORE:86%The percentage of users who liked this based on high quality reviews from sources such as Google Play, iTunes, and Amazon Music. Above 75% is green. ? A new chapter for Meek and his circle. That Mill convinces with many features, is nothing new, but this time he shines with really high-profile collaborations. Even though it’s way too long at 70 minutes, it’s got a handful of album cuts that easily rank among the rapper’s best. 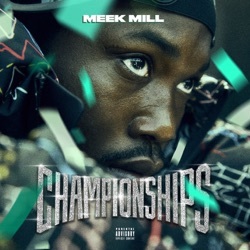 Championships is mature Mill: he quashes his longstanding feud with Drake on the trap-heavy Going Bad, and features a rare glimmer of late-career brilliance from Jay-Z on What’s Free. Tempered by both celebration and struggle, Championships shows the duality of Mill's world — one that still reflects on the past, but has made leaps towards his future — and that's perhaps the greatest win of them all. Overall, this album sets a goal and achieves it. He eliminates previous redundant tendencies while expanding his flow reservoir. Meek Mill has a lot to say on Champions, and he doesn’t miss a single beat. While the Audemars-Piguet and Rolls-Royce Wraith have not disappeared from the equation and Meek Mill’s affinity for the finer things is still intact, his conscience is the crown jewel of Championships. On ‘Championships’, his fourth studio album, Meek Mill raps with the same hunger, passion and drive that he came into the game with - which earned him veteran status at MMG as Rick Ross’s right hand lieutenant - but now with a renewed sense of purpose and direction. With a closer listen to some of the 19 tracks on Championships, it becomes clear many of the songs don't live up to the album's name — in fact, many don't even make the playoffs. Championships is as much about the poverty, violence, and Draconian jail sentences as it as about trying to move past those things. It tells his story, at least the story that has dominated conversation around him for the past year, in a raw and authentic manner. "Championships" is sadly not as triumphant as it could've been. He doesn't necessarily grow topically on this album, he's just grown in experience and it has widened the scope of his topical conversations and deliveries. After a career marked too often by botched opportunities and wasted potential, Meek Mill has finally risen to the moment. The ultimate result is an inspired release that hearkens back to the Roc-a-Fella days of the mid-Aughts, full of diaristic writing, song-cry beats and ridiculous skills. Meek has arguably never sounded sharper and Championships’ high points are very high. Meek Mill is back in a big way and this album proves it. For an album with so much importance placed on it, perhaps expectations betrayed the project, but with Meek seeming all too aware of the greater societal meaning behind his recent struggles, his insistence on releasing a perplexingly bloated, often aimless album is both a head-scratcher and a true waste of potential. Following a stretch of obstacles -- including the fight for his very freedom -- the Philly rapper emerges victorious and finds his voice on Championships. The most balanced piece of work that the rapper has put out to date. Championships runs long, but its sins of commission are forgivable, coming from a star who’s back in action — though not out of legal jeopardy, as his case is currently under appeal as he seeks a new trial — with much on his mind. Even if Championships could’ve used a slightly better editing job, there’s still a lot to like about it. Meek Mill’s Championships is eventful. Listening to the album is like attending a sporting event that’s thunderous, high-spirited, and star-studded. By opening up a little and showing the scars, he turns in his most relatable, resonant project yet, and the one that has the most potential for staying power. I enjoyed the passion he showed throughout this album, and definitely think this is at least his second best project to-date. ‘Championships’ showcases Meek’s obsession to do Philadelphia, his fans, his listeners, his family, his friends and his cohorts in the rap game right. The result is an album that dovetails beautifully from party anthems to vulnerable confessionals.